Perfect holiday decorations represents Christmas, but offer a fun twist on the traditional. 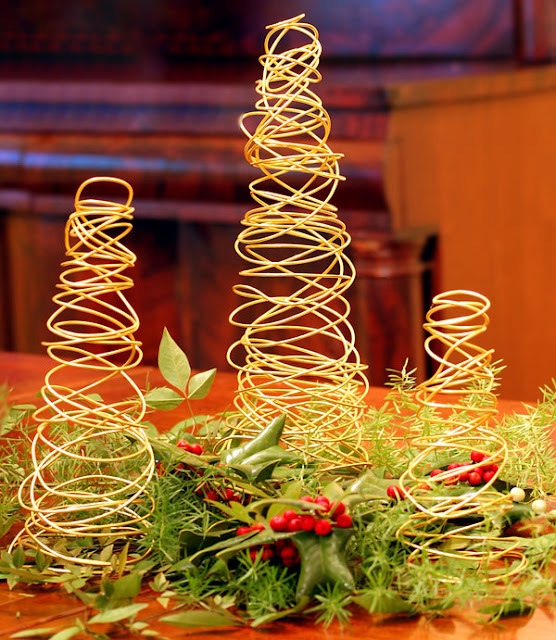 These tree shaped wire Christmas trees are exactly that kind of modern and fresh decor. Inspired by the traditional Christmas tree shape, but made with modern gold toned aluminum wire- a new favorite craft product- these trees are easy and fun to make. In this post, you will learn how to quickly create these wire trees in any size and color you choose. Aluminum craft wire comes in various colors, millimeters and styles. The 2mm version we used for this wire tree is super easy to bend and cut. It is sturdy enough to hold a shape as well. To make the wire trees, simply wrap the wire around the cone form. A standard 12" tall Styrofoam cone shape is used here. The form can be used multiple times for this project- so you will only need one cone shape for multiple trees. Start at the bottom. Wrap the wire around the cone working toward the tip. And then back down again. Continue wrapping until you get the desired look you want for the tree. Make sure to sure to wrap the bottom in even circles so your tree will stand up once the form is removed. Slide the wire off the top of the cone and adjust the wire/base as needed to make the tree stand up straight. We created three trees like this-each one a different height- by wrapping just the top portion of the cone form to create the smaller trees. The 12" tall large tree took approximately 12 yards of wire. The two smaller trees - approximately 3-4 yards each. In total we used less than 2 rolls of the 2mm gold wire, which you can purchase here. A great look for less than $8.00 worth of aluminum wire. Good luck creating your own Holiday decorations this year! What gauge wire did you use?? I just tried with 18 gauge and it wouldn't keep the shape.